An early illustration published in the Nov. 19, 1870 issue of Harper’s Weekly magazine (Vol. 14, No. 725, p. 740; can be seen in the Internet Archive website). It shows searching for alluvial diamonds along the Vaal River in South Africa. Within a few years of their discovery, the diamonds deposits of South Africa produced more diamonds than what had come from India in two millennia. The annual export of rough diamonds from the country, which in 1867-1868 was only about 200 carats, rose dramatically to approximately 3.8 million carats by 1888. Diamonds historically were found loose in sediments associated with or along rivers or streams in India and then in Brazil, but there was little, if any, recorded evidence for them being recognized in those countries in their original host rock. The fact that, beginning in 1869, diamonds were also recovered embedded in a distinctive weathered igneous host rock in South African deposits, added to the surprise and interest in them. This host rock, which was later analyzed and termed “kimberlite,” proved to be somewhat of a scientific enigma for much of the next century because of its varied and unusual geologic features. This reading list was compiled to give you an opportunity to learn more about the history of the diamond fields of South Africa. A number of the articles were published in the 1800s and early 1900s – when many classical gem deposits of historical importance were discovered – and gemology and mineralogy became sciences. The list is presented in chronological order to emphasize the development of ideas over time. The list is not comprehensive, but a compilation of the some interesting gemological information that has often been forgotten or overlooked. Many of the articles exist in the public domain and can be found online at digital libraries such as Hathitrust, Internet Archive, or other digital repositories. More recent publications can often be found in libraries, including the Richard T. Liddicoat Gemological Library. Abstracts of these articles can usually be found on the website of the original journal or magazine, and the article itself is often available for purchase from the publisher. Regarding the GIA library’s holdings and on-site access, please contact us. Christmas on the African Diamond Fields, F. St. George, Jewelers’ Circular and Horological Review, Vol. 29, No. 18, pp. 11, 13, (1894). A short story about spending the Christmas season in the Southern Hemisphere by miners from Europe and elsewhere. Diamonds and Gold – Anglo-Saxon Supremacy in South Africa, F.I. Ricarde-Seaver, New Science Review, Vol. 1, No. 1, pp. 11-23, (1894). The author discusses the economic benefits to the British Empire resulting from the discoveries of gold and diamonds in South Africa. The Diamond King, W.F. Day, Munsey’s Magazine, Vol. 11, No. 5, pp. 462-464, (1894). This article is about Cecil Rhodes and the diamond fields. Discovery of Diamonds in South Africa, Author unknown, Literary Digest, Vol. 9, No. 23, p. 687, (1894). This short article presents a slightly different version of the discovery of the first diamond. Die Diamantengruben von Kimberley [The Diamond Mines of Kimberley], A.W. Stelzner, Sitzungsberichte und Abhandlungen der Naturwissenschaftlichen Gesellschaft Isis in Dresden, Jahrgang 1893, pp. 71-85, (1894). A description of the Kimberley mines. Au Pays du Diamant [The Diamond Deposits], Author unknown, Cosmos, Vol. 31, No. 543, pp. 372-375, (1895). A short description of the diamond fields. On the Rock and Other Specimens from the Kimberley Mines, T.G. Bonney and C.A. Raisin, Geological Magazine, Vol. 2, No. 11, pp. 496-502, (1895). A geological description of kimberlite, the host rock of diamond. Notes on the Diamond-Bearing Rock of Kimberley, South Africa, J.B. Stone, T.G. Bonney, and C.A. Raisin, Geological Magazine, Series 4, Vol. 2, No. 11, pp. 492-502, (1895). The authors present how underground mining of the diamond pipes is providing better opportunities to study the diamond host rocks. “South African Mines: Their Position, Results and Developments – Volume 2”, C.S. Goldman, Effingham Wilson & Company, London, 210 pp., (1895-1896). A chapter in this book describes the principal diamond mines and information on their mining operations. Diamond Mining in South Africa, J.B. Smith, Strand Magazine, Vol. 11, pp. 346-354, (1896). A historical description of the mining operations in the diamond fields during the first 25 years. Cecil Rhodes and his colleagues begin efforts to consolidate the separate individual mines under the control of one company in 1887. Underground mining began to recover ore from a series of vertical shafts around the edge of, and horizontal galleries extending into, the kimberlite pipe. Kimberley and its Diamonds, W.G. Atherstone, Transactions of the Geological Society of South Africa, Vol. 1, No. 1, pp. 76-89, (1896). A description of the rocks types seen in the Kimberley Mine, written by the same individual who identified the first diamond found in the country in 1867. The First Diamond Pioneer in South Africa, P.E. Wolter, Imperial and Asiatic Quarterly Review, Series 3, Vol. 4, No. 7, pp. 165-168, (1897). Early efforts to find and recover diamonds in the Transvaal are summarized. Diamond Digging at De Beers, G. Griffith, Pearson’s Magazine, Vol. 3, (May), pp. 579-585, (1897). The author describes the mining operations near Kimberley. The Diamond Mines of Kimberley, W. Crookes, Nature, Vol. 55, No. 1431, pp. 519-523, (1897). A published report of a public lecture given by the author in the fall of 1896 in London. Les Nouveaux Procédés d’Extraction des Diamants du Cap [The New Process to Extract Diamonds at the Cape], L. de Launay, La Nature, Vol. 25-2, No. 1257, pp. 70-74, (1897). The author presents a description of the diamond mining operations in South Africa. Zur Theorie der Diamantlagerstätten in Südafrika [On The Theory of the Diamond Deposits of South Africa], G. Gürich, Zeitschrift für Praktische Geologie, Vol. 5, (May), pp. 145-148, (1897). A discussion of a theory of the origin of the diamond deposits. "Les Diamants du Cap" [The Diamonds of the Cape], L. de Launay, Librairie Polytechnique, Paris, 239 pp., (1897). This book describes the occurrence, geologic setting and mining of diamonds in South Africa. Südafrika’s Diamanten [South African Diamonds], P. Frehde, Himmel und Erde, Vol. 11, No. 11, pp. 500-506, (1898). A description of the diamond fields and mining operations. “The Diamond,” D. Draper, Matthews and Walker, Johannesburg, (1898). The pamphlet provides practical advice for prospectors traveling to the diamond fields. L’Exploitation des Mines de Diamants a Kimberley [The Exploitation of the Diamond Mines at Kimberley], A. Bordeaux, Revue Universelle des Mines de La Métallurgie, Series 3, Vol. 43, pp. 221-237, (1898). The author describes the geologic setting and mining operations near Kimberley. Diamond Mining in South Africa, T.H. Leggett, Cassier’s Magazine, Vol. 14, No. 3, pp. 371-393, (1898). A detailed description of the diamond mining operations and their historical development. Géologie de la République Sud-Africaine du Transvaal [Geology of the Republic of South Africa and the Transvaal], G.A.F. Molengraaff, Bulletin de la Société Géologique de France, Ser. 4, Vol. 1, pp. 13-92, (1898). The author reviews the geological setting of the Transvaal diamond mines. Die Diamantengruben von Kimberley [The Diamond Diggings of Kimberley], A.W. Stelzner, Sitzungsberichte und Abhandlungen der Naturwissenschaftlichen Gesellschaft Isis in Dresden (Jahrgang 1893), pp. 71-85, (1894). The author describes the diamond mines. Les Mines Diamantifères de Kimberley [The Diamond Mines of Kimberley], E. Maison, Cosmos, Vol. 41, No. 771, pp. 597-598, (1899). A short article on the mines. Where the Diamonds Come From, R.M. Sillard, English Illustrated Magazine, Vol. 20, No. 186, pp. 647-652, (1899). The author describes some of the Africans and individuals from all parts of the world at Kimberley and the diamond mines. How Diamonds are Mined at Kimberley, Author unknown, Jewelers’ Circular, Vol. 39, No. 16, pp. 1, 4, 7, (1899). According to the author, the mines around Kimberley produce 95% of the world’s diamonds. The Parent-Rock of the Diamond in South Africa, T.G. Bonney, Chemical News, Vol. 80, No. 2067, pp. 3-6, and No. 2068, pp. 13-15, (1899). While occurring in kimberlite, the true parent rock of the diamond is eclogite, which is brought up from great depths in the earth by the formation of kimberlite pipes. A similar article appeared in Nature, Vol. 60, No. 1565, pp. 620-621, (1899) and in the Proceedings of the Royal Society of London, Vol. 65, pp. 233-236 (1899). Discovery of the First South African Diamond, Author unknown, Canadian Magazine, Vol. 15, No. 3, pp. 268-269, (1900). This short articles describes the circumstances of the discovery of the first diamond in early 1867, as was reported by W.G. Atherstone in the Cape Illustrated Magazine in an 1867 article. L’Histoire des Mines de Diamants de Kimberley [The History of the Kimberley Diamond Mines], Author unknown, Cosmos, Vol. 42, No. 799, pp. 613-616, (1900). A brief description of the diamond fields. “The Diamond Mines of South Africa – Some Account of their Rise and Development,” G.F. Williams, Macmillan Company, New York, 681 pp. (1902). This book provides the most detailed description of the South African diamond fields and diamond mining. A summary written by G.F. Kunz appears in Science Magazine, Vol. 17, No. 435, pp. 695-701, (1903). The original book was reprinted in two volumes in 1906 by B.F. Buck and Company, New York. The author gave an abbreviated version on just the mines in Kimberley in “Science in South Africa – A Handbook and Review,” Sec. 6-2, pp. 317-331, (1905). Occurrence of Diamonds in South Africa, with the Method of their Extraction as Adopted by the DeBeers Diamond Mines, L.J. Abrahams, Journal of the Canadian Mining Institute, Vol. 5, pp. 62-75, (1902). The author describes the method of recovering diamonds from kimberlite pipes. Diamond Mining in Kimberley, Author unknown, The Engineer, Vol. 95, (Jan. 16, 1903), pp. 59-60, 66 and (Jan. 30 1903), pp. 113-114 and 116-117, (1903). Detailed information and photographs of the diamond mining operations. The Phenomena of the Diamondiferous Deposits in South Africa, E.F. Heneage, Transactions of the Institution of Mining and Metallurgy, Vol. 12, pp. 115-139, (1903). The author presents a number of scientific questions on diamond formation and geologic occurrence that resulted from their discovery in the Cape Colony more than 30 years earlier. Diamond Mining in the Kimberley Field, C.V. Allen, Engineering Magazine, Vol. 26, No. 1, pp. 81-98 and The Mechanical Equipment of the Kimberley Diamond Mines, Engineering Magazine, Vol. 26, No. 2, pp. 177-192, (1903). 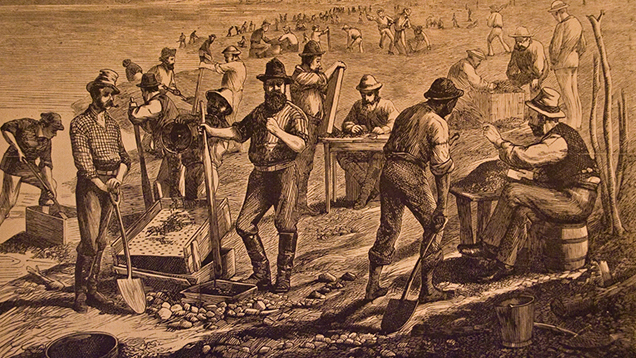 Both articles give a detailed description of diamond mining at Kimberley. Diamond Mining, Author unknown, The South African Yearbook 1903-1904, pp. 526-530, (1904). A short description of the diamond fields is provided, along with production amounts for the mines between 1867 and 1902. The First Discoverer of Diamonds in South Africa, C.S. Crossman, Mineral Collector, Vol. 11, No. 2, pp. 26-28, (1904). A short story of American adventurer Henry E. Dorr, who traveled to South Africa in early 1859 and had the opportunity to go to the interior of the country. He claims to have found a rough diamond in a streambed in an area south of the Orange River that exhibited the physical appearance and properties of diamond. The Diamond Placers of the Vaal River, South Africa, F.E. Coe, Transactions of the Institution of Mining and Metallurgy, Vol. 13, pp. 518-537, (1904). Placer diamond deposits along the Vaal River are described. Quelques Observations sur les Champs Diamantifères de Kimberley [Some Observations on the Diamond Fields of Kimberley], H. Buttgenbach, Annales de la Société Géologique de Belgique, Vol. 32, pp. 3-14, (1904). The author presents some geological observations on the rock types found in the diamond fields. The Geological Features of the Diamond Pipes of the Pretoria District, H. Kynaston and A.L. Hall, Report of the South African Association for the Advancement of Science, Sec. 13, pp. 182-195, (1904). The authors review the geological features of the diamondiferous pipes where mining operations were being carried on. Über einige Neue Diamantlagerstätten Transvaals [On a New Diamond Locality in the Transvaal], A.L. Hall, Zeitschrift für Praktische Geologie, Vol. 12, (June), pp. 193-199, (1904). A review of diamond production and the geological setting of the mines. The Diamond Mines of South Africa, Author unknown, Knowledge and Scientific News, Vol. 2, July, pp. 174-175, (1905). This article summarizes the geologic setting of the diamond mines and mentions some of the famous large diamonds discovered, including the “Cullinan” found on Jan. 25, 1905 at the Premier Mine. Early Discoveries of Diamonds, D. Draper, Engineering and Mining Journal, Vol. 79, No. 13, pp. 612-613, (1905). The author recounts some of the early discoveries of diamonds near Kimberley. Diamonds, W. Crookes, Chemical News, Vol. 92, No. 2391, pp. 135-140, No. 2392, pp. 147-150, No. 2393, pp. 159-163, (1905). A summary of a public lecture on diamonds, given in Kimberley, that contains information on the occurrence and mining of diamonds in South Africa. A Home of Diamonds, T.G. Bonney, Cornhill Magazine, Vol. 18, No. 107, pp. 614-623, (1905). The author reviews the developments and evidence that lead geologists to recognize that kimberlite pipes were the source rocks for diamonds. “The Geology of South Africa,” F.H. Hatch and G.S. Corstorphine, Macmillan Company, London, pp. 271-300, (1905). This book contains a chapter on the diamond-bearing volcanic pipes found at several places in South Africa. The Genesis of the Diamond, G.F. Williams, Transactions of the American Institute of Mining Engineers, Vol. 35, pp. 440-455, (1905). The author reviews ideas on the genesis of the South African diamonds. The same article was published in the Annual Report of the Board of Regents of the Smithsonian Institution, pp. 193-209, (1906). Ueber die Diamantenminen in Südafrika [About the South African Diamond Mines], Author unknown, Die Welt der Technik, Vol. 68, No. 16, pp. 335-337, (1906). A brief description of the diamond mines. "Following the Equator”, M. Twain, Vol. 2, Chap. 23, pp. 392-402, (1906). Mark Twain describes a visit to the diamond mines in his year-long lecture tour around the world in 1895-1896. Mining Diamonds in South Africa, J.S. Hamilton, The World’s Work, Vol. 12, No. 4, pp. 7904-7907, (1906). The author traveled to Kimberley and describes the diamond mining operations. The Master of the Diamond Mines, M.G. Cunniff, The World’s Work, Vol. 13, No. 1, pp. 8211-8215, (1906). An article about the life of Gardiner F. Williams, the general manager of the De Beers mines at Kimberley from 1887 to 1905. The Diamond Mines of South Africa, G.F. Williams, National Geographic Magazine, Vol. 17, No. 6, pp. 344-356, (1906). A description on the development of diamond mining, based on a public lecture given by the general manager of the De Beers mines. The Diamond Pipes and Fissures of South Africa, H.S. Harger, Transactions of the Geological Society of South Africa, Vol. 8, pp. 110-134, (1906). A detailed description of the kimberlite pipes and fissures that contain diamonds. Diamond Mining, H. Leffmann, Journal of the Franklin Institute, Vol. 164, No. 984, pp. 407-412, (1907). A summary of a public lecture on diamond mining methods. Address [on Diamonds], G.F. Williams, Report of the South African Journal of Science, pp. 3-10, (1907). The report on a public lecture by the general manager of the De Beers mines, who presents the history of South Africa and the discovery of diamonds. A Visit to the De Beers Consolidated Diamond Mines, E.P. Rathbone, Transactions of the Institution of Mining and Metallurgy, Vol. 16, pp. 200-204, (1907). Based on a visit to the mining area, the author describes some of the mechanical and labor-saving devices used in the underground mines, including electrically transporting the kimberlite ore within the workings and rapidly hoisting the ore to the surface with mechanical equipment. The Origin of the River Diamonds within the Area of the Vaal, H. Merensky, Transactions of the Geological Society of South Africa, Vol. 10, pp. 107-111, (1907). The typical appearance of the alluvial diamonds from the Vaal River is described. The Petrography of the Rocks Surrounding the Diamond-Pipes of the Kimberley District, R.H. Rastall, Report of the South African Journal of Science, pp. 269-288, (1907). A description of some of the rocks that surround the diamond pipes exposed in the Kimberley and De Beers mines. The Premier Diamond Mine, Transvaal, South Africa, R.A.F. Penrose, Economic Geology, Vol. 2, No. 3, pp. 275-284, (1907). The operations at the Premier mine are described. Untersuchungen über einige Südafrikanische Diamantenlagerstätten [Investigation of some South African Diamond Deposits], R. Beck, Zeitschrift der Deutschen Geologischen Gesellschaft, Vol. 59, pp. 275-307, (1907). A geological description of some of the diamond deposits. The Occurrence in Kimberlite of Garnet-Pyroxene Nodules Containing Diamonds, G.S. Corstorphine, Transactions of the Geological Society of South Africa, Vol. 10, pp. pp. 65-68, (1907). The author comments on the diamond-containing eclogite nodules sometimes found in kimberlite, and whether they represent the original rock in which diamond formed. On the Supposed Kimberlite Magma and Eclogite Concretions, T.G. Bonney, Transactions of the Geological Society of South Africa, Vol. 10, pp. 95-100, (1907). The author’s views on the diamond-bearing eclogite nodules found in some kimberlite pipes. “The Discoveries of Economic Importance Made by the Albany Pioneers,” E.H.L. Schwarz, African Book Company, Grahamstown, pp. 1-15, (1908). This booklet presents the text of a public address about those connected with the discovery of diamonds in 1867, including W.G. Atherstone. The Diamond Mines of Kimberley, W.G. Fitz-Gerald, St. Nicholas – An Illustrated Magazine, Vol. 35, No. 3, pp. 224-227, (1908). A brief description of the mines. Kimberlite Dikes and Pipes, The Origin of Diamonds, and Further Remarks on the Kimberlite Rock and the Origin of Diamonds, F.W. Voit, Transactions of the Geological Society of South Africa, Vol. 10, pp. 69-74, pp. 75-80 and 101-106, (1908). The author presents observations on kimberlite rocks and ideas about their origin in three articles. Cape Colony, Orange River Colony, and Transvaal Diamonds, R.S.G. Stokes, “Mines and Minerals of the British Empire”, pp. 213-233, (1908). This book contains a chapter on the South African diamond fields. “Kimberlite” and the Source of the Diamond in South Africa, F.H. Hatch, Nature, Vol. 77, No. 1993, pp. 224-226, (1908). A summary of the varied opinions of several researchers who have commented and written about the host rock of diamond and its origin. Petrographic Note on the Diamond-Bearing Peridotite of Kimberley, South Africa, V. Hartog, Economic Geology, Vol. 4, No. 5, pp. 438-453, (1909). The author presents the geological features of the peridotite that hosts the diamonds. Diamond Mining in South Africa, T. Mann, International Socialist Review, Vol. 11, No. 1, pp. 1-6, (1910). Diamond mining and the difficult living and working conditions for the African mine workers are presented. The Larger Diamonds of South Africa, L.J. Spencer, Mineralogical Magazine, Vol. 16, No. 74, pp. 140-148, (1911). The author presents a list of 26 rough diamonds, each weighing more than 85 carats, found in the country. The same article was published in the Jewelers’ Circular Weekly, Vol. 63, No. 26, pp. 51-53, (1912). The History of the Kimberley Mines, E.M. Weston, Engineering and Mining Journal, Vol. 92, No. 5, pp. 207-208, (1911). A short description of diamond mining operations. Mining Methods at Kimberley, J.T. Fuller, Engineering and Mining Journal, Vol. 94, No. 19, pp. 887-891, and No. 20, pp. 943-948, (1912). This article describes the mining methods used at Kimberley. Open-pit mining is used for the upper 300 to 500 feet of the kimberlite pipe, and vertical shafts and horizontal adits are used to reach deeper levels. Diamond Occurrences in the Pretoria District, Author unknown, South African Mining Journal, Vol. 21-2, No. 401, pp. 847-850, (1912). A description of a number of occurrences, including the Premier Mine. Analogies between the Diamond Deposits of Brazil and South Africa, D. Draper, Mining Magazine, Vol. 9, No. 6, pp. 435-436, (1913). The author compares the diamond deposits of Brazil with those in South Africa. “The Diamond Fields of Southern Africa”, P.A. Wagner, Transvaal Leader, Johannesburg, 347 pp., (1914). This book describes in detail the history, geologic occurrence and mining of diamonds in South Africa. Protecting Kimberley’s Diamonds, E. Irving, Technical World Magazine, Vol. 21, No. 6, pp. 637-638, (1914). The author presents some methods used to steal diamonds at the mines and the steps taken to prevent theft. Kimberley Diamonds and De Beers, F. Conly, Engineering and Mining Journal, Vol. 98, No. 3, pp. 121-125, (1914). The author gives a brief description and shows several photographs of the De Beers mines. Mining Engineering Problems in South African Diamond Development, G.F. Williams, Engineering and Mining World, Vol. 42, No. 7, pp. 319-325, No. 9, pp. 405-409, No. 11, pp. 505-509, No. 13, pp. 587-592, and No. 19, pp. 847-851, and Mining Methods at Kimberley, Mining Magazine, Vol. 13, No. 1, pp. 19-27, (1915). De Beers’ general manager describes some of the unique engineering problems encountered in diamond mining. Methods of Shipment of Diamonds from Kimberley, Author unknown, Mining Magazine, Vol. 14, No. 4, p. 212, (1916). This brief article describes the methods used to ship rough diamonds from Kimberley to London. The Vaal River Diggings in Griqualand West, C.W. Boise, Mining Magazine, Vol. 14, No. 1, pp. 30-31, (1916). The author briefly describes the diamond diggings after a visit to the Vaal River. The Orange River Diamond Fields, P.A. Wagner, South African Mining Journal, Vol. 26-1, No. 1325, pp. 564-566, No. 1326, pp. 589-590, and No. 1328, pp. 25-26, (1917). The important alluvial deposits along the upper portion of the Orange River, discovered by accident in 1914, are described. Early History of the South African Diamond Fields, E.J. Dunn, Mining Magazine, Vol. 19, No. 5, pp. 268-272, (1918). The author recounts early events surrounding the discovery and development of the diamond fields. Kimberley Diamonds – Especially Cleavage Diamonds, J.S. Sutton, Chemical News, Vol. 118, No. 3066, pp. 31-34, No. 3067, pp. 38-41, No. 3068, pp. 55-58, and No. 3069, pp. 64-67, (1919). This publication compares rough diamonds from the several Kimberley mines. The author published a more complete version of this topic in the Transactions of the Royal Society of South Africa, Vol. 7, No. 1, pp. 65-96, (1918). X-Rays for Detecting Diamond Thieves, Author unknown, The Month: Science and Arts, Vol. 97, No. 497, pp. 141-142, (1920). A brief on the use of X-rays to conduct body scans of workers to prevent the theft of diamonds. The Story of Diamonds, Author unknown, South African Mining and Engineering Journal, Vol. 29-2, No. 1511, pp. 711-712, (1920). The history of the diamond discovery is briefly recounted. The Beginnings of the Diamond Fields, W.P. Taylor, South African Mining and Engineering Journal, Vol. 30-1, No. 1560, pp. 1701-1702, (1921). The author describes some of the individuals involved with the early history of the diamond fields. Alluvial Diamond-Diggers in South Africa, S.P. Joubert, South African Journal of Industries, Vol. 4, No. 8, pp. 702-712, (1921). This article reviews the types of alluvial diamond deposits and how they are exploited. De Beers Fifty Years Ago!, W.P. Taylor, South African Mining and Engineering Journal, Vol. 32-1, No. 1562, pp. 1763-1764, (1921). The author recounts some of the events that lead to the creation of the De Beers Company in Kimberley in the 1870s. The Lure of the Diamond, C. Zinn, South African Mining and Engineering Journal, Vol. 34-1, No. 1651, pp. 253-254, (1923). The author describes some of the individuals involved with the early development of the diamond industry in South Africa. The Diamond Deposits on the Coast of Little Namaqualand, P.A. Wagner and H. Merensky, Transactions of the Geological Society of South Africa, Vol. 31, pp. 1-42, (1928). The discovery of alluvial diamonds in 1908 lead to the development of detrital mining operations along a 300-mile section of the western coast of South Africa over the following decade. The Diamond Mines of South Africa, F.L. Garrison, Journal of the Franklin Institute, Vol. 211, No. 2, pp. 197-224, (1931). Article not seen. “The Story of De Beers,” H.A. Chilvers, Cassell & Company, London, 344 pp., (1939). This book reviews the history of the development of the De Beers company and its economic and other activities in Southern Africa. Alluvial Diamonds in South Africa, W.E. Sinclair, Mining Magazine, Vol. 62, No. 4, pp. 213-219, (1940). The author describes the alluvial workings near Lichtenburg and other small towns lying west and southwest of Johannesburg. The Development of the Vaal River and its Deposits, H.B.S. Cooke, Transactions of the Geological Society of South Africa, Vol. 49, pp. 243-262, (1946). A geological description of the alluvial diamond deposits along the Vaal River. Diamonds in History and Legend, S. Tolansky, Optima, Vol. 12, No. 1, pp. 44-50, (1962). This article presents the historical use of diamonds for personal adornment. A Classification Scheme for Diamond and a Comparative Study of South African Diamond Characteristics, J.W. Harris, J.B. Hawthorne, M.M. Oosterveld, and E. Wehmeyer, Physics and Chemistry of the Earth, Vol. 9, pp. 765-784, (1975). The authors present a classification scheme for rough diamonds, categorized by crystal shape, transparency, crystal angularity, crystal regularity and inclusion content. Diamonds, Diggers and Dreams, D.E. Schaefer, Optima, Vol. 31, No. 2, pp. 74-90, (1983). The author recounts the early history of the diamond fields. A Comparison of Diamond Characteristics from the De Beers Pool Mines, Kimberley, South Africa, J.W. Harris, J.B. Hawthorne and M.M. Oosterveld, Annales Scientifique de Université Clermont-Ferrand 2, Vol. 74, pp. 1-13, (1984). A comparison of parcels of rough diamonds from the Bultfontein, De Beer, Dutoitspan and Wesselton mines. The De Beers Kimberlite Pipe – A Historic South African Diamond Mine, C.R. Clement, J.W. Harris, D.N. Robinson, and J.B. Hawthorne, “Mineral Deposits of South Africa”, pp. 2193-2214, (1986). The authors describe the one of the main mines near Kimberley which, since its discovery in 1871, has produced approximately 25 million carats of diamonds. The Deposition and Distribution of Alluvial Diamonds in South Africa, B.D. Maree, South African Journal of Geology, Vol. 90, No. 4, pp. 428-447, (1987). The geologic events leading to the formation of the alluvial diamond deposits are reviewed by the author. Marine Mining of Diamonds off the West Coast of South Africa, J.J. Gurney, A.A. Levinson, and H.S. Smith, Gems & Gemology, Vol. 27, No. 4, pp. 206-219, (1991). This article provides a review of the alluvial diamond mining operations. South Africa and the International Diamond Trade: Part One – Sir Ernest Oppenheimer, De Beers and the Evolution of Central Selling, 1920-1950, C. Newbury, South African Journal of Economic History, Vol. 10, No. 2, pp. 1-22, (1995). The author presents an analysis of the rise and performance of the De Beers Consolidated Mines Ltd.
Diamonds Through the Decades: A Review of South African Production, M.G.C. Wilson, Geotimes, Vol. 42, No. 7, pp. 14-18, (1997). The author reviews the secondary and primary diamond deposits in the country. Kimberley: Diamond City, T. Waltham, Geology Today, Vol. 13, No. 3, pp. 97-120, (1997). The author recounts the history and development of Kimberley as a diamond mining center. Tertiary-Age Diamondiferous Fluvial Deposits of the Lower Orange River Valley, Southwestern Africa, R.J. Jacob, B.J. Bluck, and J.D. Ward, Economic Geology, Vol. 94, No. 5, pp. 749-758, (1999). The authors describe the diamond-bearing gravel terraces exposed along the lower section of the Orange River valley. This river is the principal drainage system for the interior of southern Africa and was the main conduit for transportation of diamonds to the Atlantic coast. Post-Gondwana Drainage and the Development of Diamond Placers in Western South Africa, M.C.J. de Wit, Economic Geology, Vol. 94, No. 5, pp. 721-740, (1999). The geological history of the major river systems and the development of the placer diamond deposits along the Atlantic coast. The Roles of Primary Kimberlite and Secondary Dwyka Glacial Sources in the Development of Alluvial and Marine Diamond Deposits in Southern Africa, J.M. Moore and A.E. Moore, Journal of African Earth Sciences, Vol. 38, No. 2, pp. 115-134, (2004). The authors review the geologic events that lead to the formation of the secondary diamond deposits. Diamond Mega-Placers: Southern Africa and the Kaapvaal Craton in a Global Context, B.J. Bluck, J.D. Ward and M.C.J. de Wit, Geological Society of London Special Publication, Vol. 248, pp. 213-245, (2005). The authors review the geological setting of the South African placer deposits, which over their time of production, are reported to have produced more than 120 million carats of diamonds. A Review of the Alluvial Diamond Industry and the Gravels of the North West Province, South Africa, M.G.C. Wilson, G. Henry and T.R. Marshall, South African Journal of Geology, Vol. 109, No. 3, pp. 301-314, (2006). The authors present the principal alluvial diamond fields and the evolution in exploration techniques to locate these deposits. Mary Elizabeth Barber, Some Early South African Geologists, and the Discoveries of Diamonds, A. Cohen, Earth Science History, Vol. 22, No. 2, pp. 156-171, (2007). The author describes a group of second generation British immigrants based around Grahamstown who, in the later half of the 19th century, were interested in the scientific study of nature and their surroundings. Among this group were individuals involved with the discovery of diamonds in 1867. Kimberlite-Hosted Diamond Deposits of Southern Africa: A Review, M. Field, J. Stiefenhofer, J. Robey and S. Kurszlaukis, Ore Geology Reviews, Vol. 34, No. 1/2, pp. 33-75, (2008). The authors review more than a century of research on the geological setting and origin of the kimberlite-hosted diamond deposits. South African Diamonds: A Photographic Personal Perspective, B. Cairncross, Rocks & Minerals, Vol. 89, No. 1, pp. 76-88, (2014). The author presents photographs and other information on South African diamonds. Dr. James Shigley is a distinguished research fellow at the Gemological Institute of America in Carlsbad, California. Amber has been found in various parts of the world, but the main historical source is the land that surrounds the Baltic Sea. The discovery of diamonds in South Africa in early 1867 marked the start of an historic period of diamond exploration. Within a few years of their discovery, the diamonds deposits of South Africa produced more diamonds than what had come from India in two millennia.